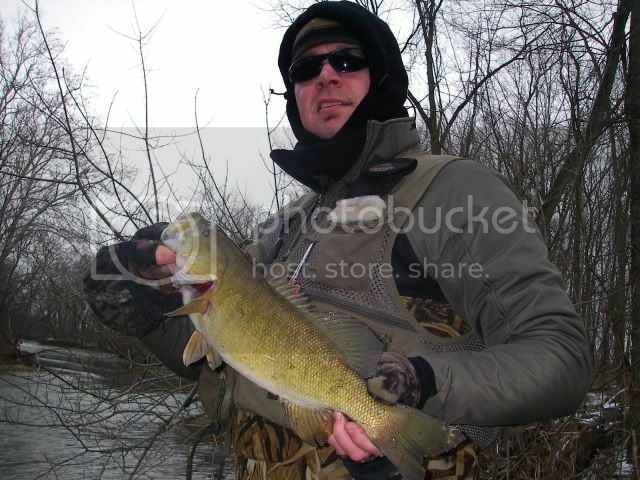 I called Jbcook for some wintertime bronze fishing. He was just waking up so must not have realized the weather wasn't great. Slight breeze, flow was up around 1,000, and the air temps were in the mid-twenties, Partly cloudy. We aranged to meet at 2pm and got fishing by 2-230pm. Jason hit the first fish, a 14"er on a Hairy Bug Jig. 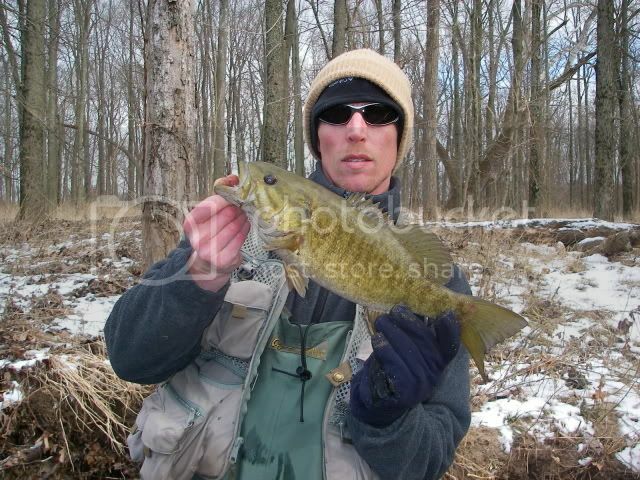 I finally found the Smallies and hit 4 on FnF in about 25 minutes from 12-15". We decided to move to another spot. As fate would have it, we were chatting about things when I realized we might have missed our first hole. We cut short and ended up on the side opposite of where I ususally work. Two big downed trees stood parralell to the stream next to 3-4' of water. I zipped a float in between the seam and the rootwad. Quickly the float dunked and I wrestled a 16.5"er to hand. Then a 12-13"er. Then Jason hit this 16.5" on a hairy bug jig in the same spot only on the bottom! Jason lost a good fish on a break off that had his pole bent double. Jig still in fish jaw! It shook a few times afterwards and we could see it was in the 17-18" range. The fish had wrapped JB's line on a root. Then I lost a jig in that same rootwad and decided to climb up on top of the upturned rootwad. I caught 7 fish 13-17" + crappie in the next 30 minutes on float and fly, they were using the rootwad as a current break to the eddying water! JB hooked another good one, that shook of at his feet. The fish were really stacked in there! We had to let the spot cool as neither of us got a bite for 20 minutes. Moved up to another pool and caught a small LMB and 4 more crappie. We went back to the laydowns 45 minutes later and the fish were back. JB landed a nice 15" on the HB, I got a couple more on FnF 12-14". We were both cold so we headed back after 22 fish between us in a bout 3.5 hours. Hope that broke the cabin fever for ya, JB!